1. In a Small bowl, mix together mayonnaise and miracle whip. Spread onto both sides of the center of each roll. Place a slice of ham and a slice of Swiss inside of each roll. 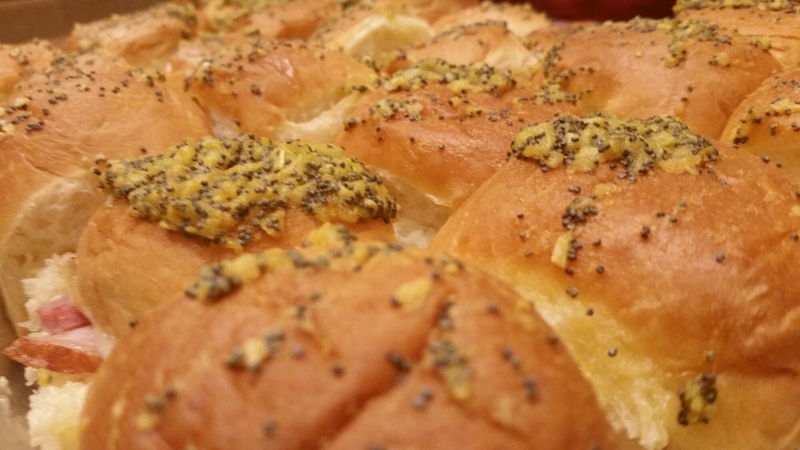 Close rolls and place them into a large baking dish or heavy cookie sheet. Place very close together. 2. In a medium bowl, whisk together all of the poppy seed sauce ingredients. Pour evenly over all of the sandwiched. You do not have to use all if the sauce. Just enough to cover the tops. Let zit 10 minutes or until butter sets slightly. Cover with foil and bake at 350 degrees for 12 to 15 minutes or until cheese is melted. Uncover and bake additional 2 minutes or until tops are slightly brown and crispy. Serve warm. 1. Preheat oven to 450 degrees. Wash and cut potatoes into wedges by citing lengthwise in half then slice each half into 3 slices. 2. Place potatoes in a bowl of water with about 2 cups of ice cubes. Let them stand for 30 minutes them pat dry with paper towel. 3. Place salt, garlic powder, paprika, and black pepper into a large zip lock bag. Add potatoes and shake them together. Next add the olive oil to the bag and toss until potatoes are coated. 4. Line baking sheet with parchment paper. Place potatoes on the lined sheet and bake at 450 degrees for 30 to 35 minutes until the potatoes are cooked through, browned and crispy. 5. While potatoes are baking, chop 2 tablespoons fresh parsley and grate 1/4 cup parmesan cheese and place both in a large mixing bowl. 6. 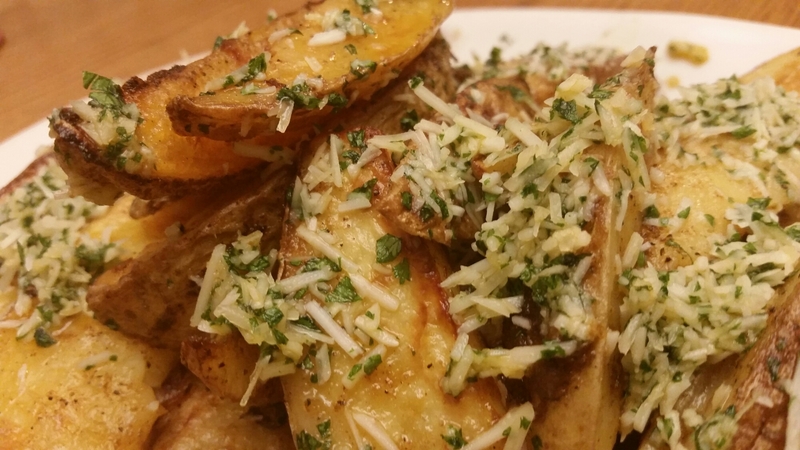 Toss potato wedges in the mixing bowl with parsley and cheese. 1. Preheat oven to 350 degrees. Line an 8×8 inch pan with aluminum foil and spray with cooking spray. 2. In large mixing bowl, add the butter and heat in microwave about 90 seconds. 3. Add the brown sugar, vanilla, and whisk until smooth. 4. Add the flour, oats, baking soda, and pinch of salt and stir until combined. 5. Add half of the mixture to the prepared pan, and smooth it with a spatula or the back of a spoon. 6. Bake for 10 minutes. While it bakes make the caramel sauce. 7. In large bowl, combine the caramels, cream and heat of on the microwave in 60 second bursts to melt the caramels, stirring after each burst. It will likely take 4 to 5 minutes total to melt. 8. After 10 minutes remove pan from the oven and evenly sprinkle with the chocolate. 9. Slowly and evenly pour caramel sauce certain the chocolate. 10. 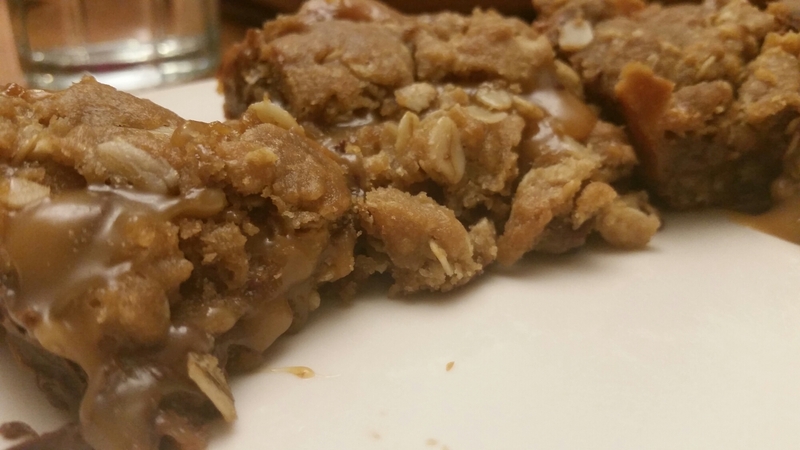 Evenly crumble reserved oatmeal – brown sugar mixture over top. 11. Return pan to oven and bake for 15 to 18 minutes or until edges ate lightly browned and center is bubbling slightly. 12. Allow bars to cool completely in pan before slicing and serving. Over all this week’s meal was pretty simple and easy. I really like the potato wedges the most, because they were very flavorful. I ended up not really liking the Ham and Cheese Sliders very much for my personal taste. One of the things I wish I had done differently was cooling the Carmelitas. I let them sit for four and a half hours and the caramel still hadn’t dried completely so when I cut into it to serve, it was a mess. However, they were still very tasty. My family really enjoyed this meal, even though I think they feel a pressure to complement my work. Sausage and Potato Bake. Homemade Snicker Bars. Fajitas. Spanish Rice. Apple Pie.